Ideal to Remotely Monitor Your Teenager's PC Internet Activities From Anywhere. Monitor and Spy on Your Teenager From Any Internet Location! The first software of its kind... Realtime Spy allows you to remotely install the software on any computer you own* as well as view the log files from anywhere in the world via your own personal Realtime Spy webspace! 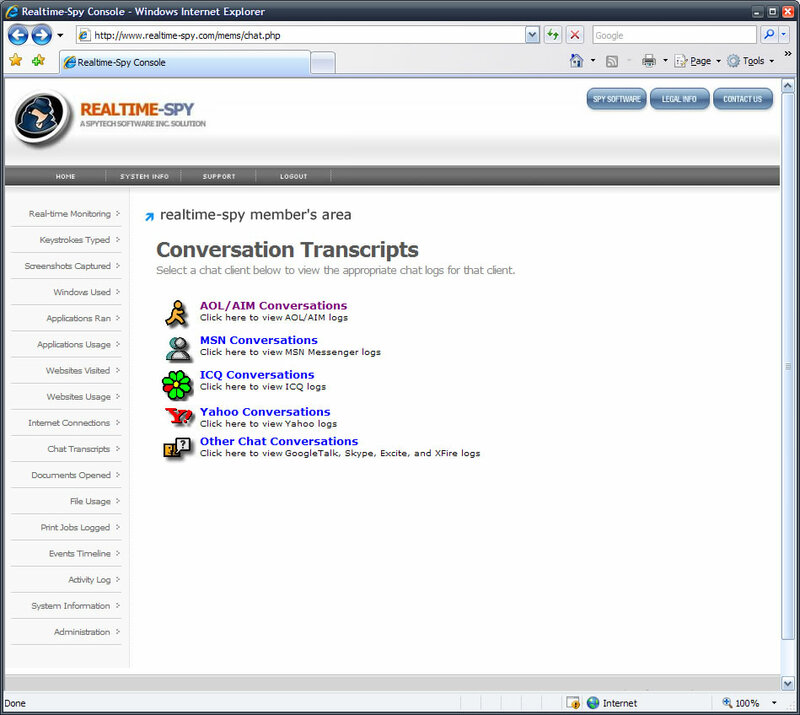 Realtime Spy allows you to see what teenagers do, and what teenagers type, as they perform the actions, in real time. Once installed, all log files are uploaded secretly to your personal Realtime Spy account on our webserver. This enables you to view reports in real time from anywhere in the world. 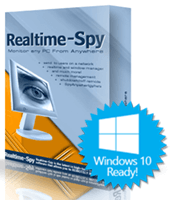 Realtime Spy allows you to monitor any PC you own from anywhere - without needing to have physical access to that PC! Realtime Spy is remotely installable and runs invisibly once installed. Remote Installation without physical presence needed for installation. 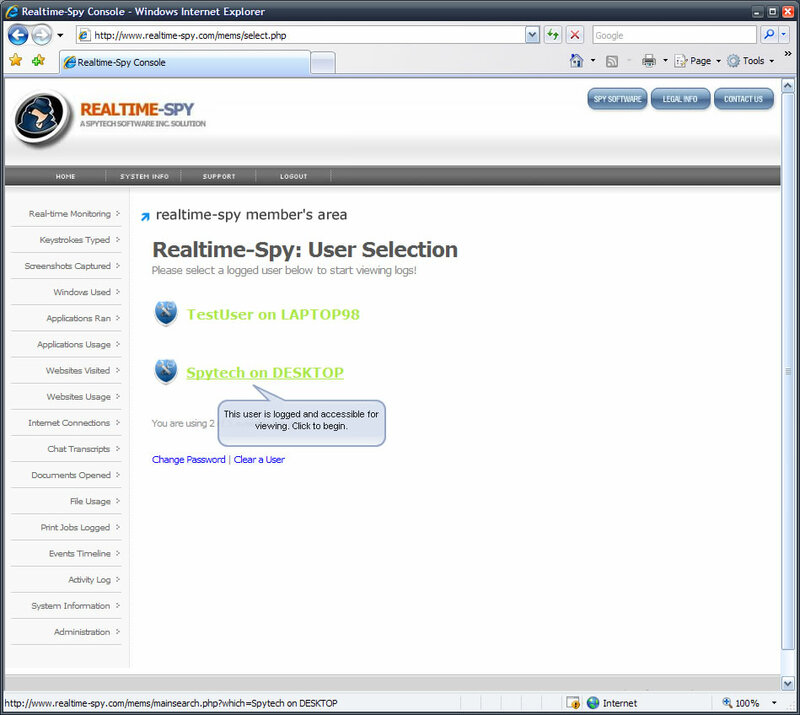 Realtime Spy can later be uninstalled and permanently disallowed from running on a remote computer, again without physical interaction with the remote computer. 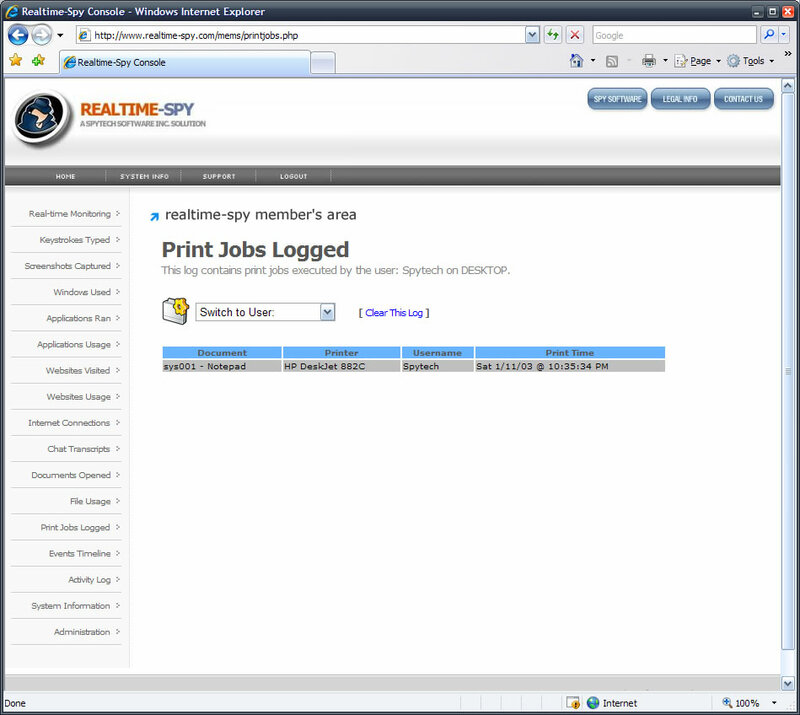 Realtime Spy's logging settings can be enabled or disabled remotely without having to reinstall the logging software on the monitored computer. Click here to Read How it Works! 24/7 access to the monitored PC, from any location via your personal website address given to you after you purchase! Activity logs are updated every half-hour for constant review. Log and record MULTIPLE PC's you own from ONE REMOTE LOCATION without any extra configuration - just click what user names you want to view logs for! Usernames are categorized by what PC they are logged under for easy user selection. 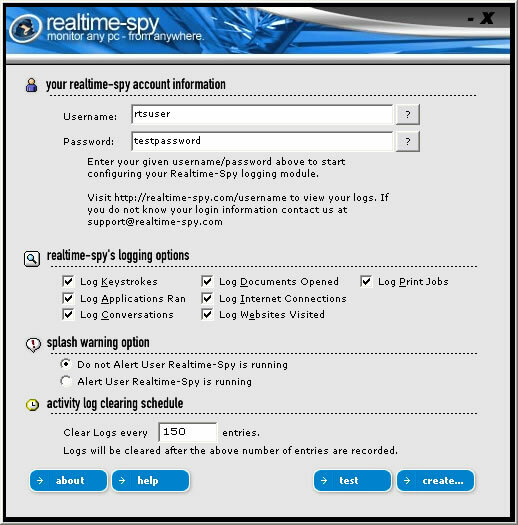 As Realtime Spy's name implies, it can show you what actions teenagers do in real-time at the exact instant they perform an action - from programs being opened and closed, to file activity and website visits. Realtime Spy can also display what teenagers are typing in real-time, as they type. Realtime Spy can monitor any PC regardless of its Internet connection. Most other remote deployable monitoring solutions will not work behind a hardware firewall, router, LAN, or if they are on a dialup connection - but Realtime Spy will! 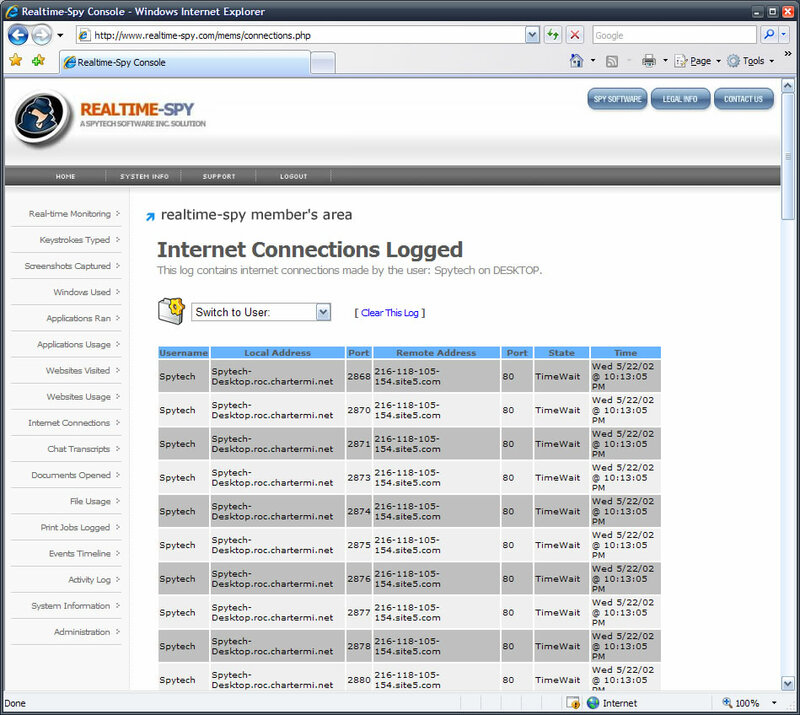 No matter what Internet connection the remote PC uses, you will be able to view logs from your Realtime Spy webpage. Realtime Spy runs in COMPLETE STEALTH and cloaks itself to hide from the remote teenager! The file you send to the remote teenager is able to be discarded and deleted - without affecting Realtime Spy's monitoring process! Please note that Realtime Spy does tell the teenager that monitoring software is being installed, and they have the option to cancel the install, but once installed the software runs invisibly. Realtime Spy can record nearly everything a teenager does on their PC - from keystrokes, to website visits, to printer activity and files opened! Realtime Spy's activity logging will give you an in-depth, detailed look at what teenagers are doing on your computer. Realtime Spy allows you to see what teenagers do in real-time. 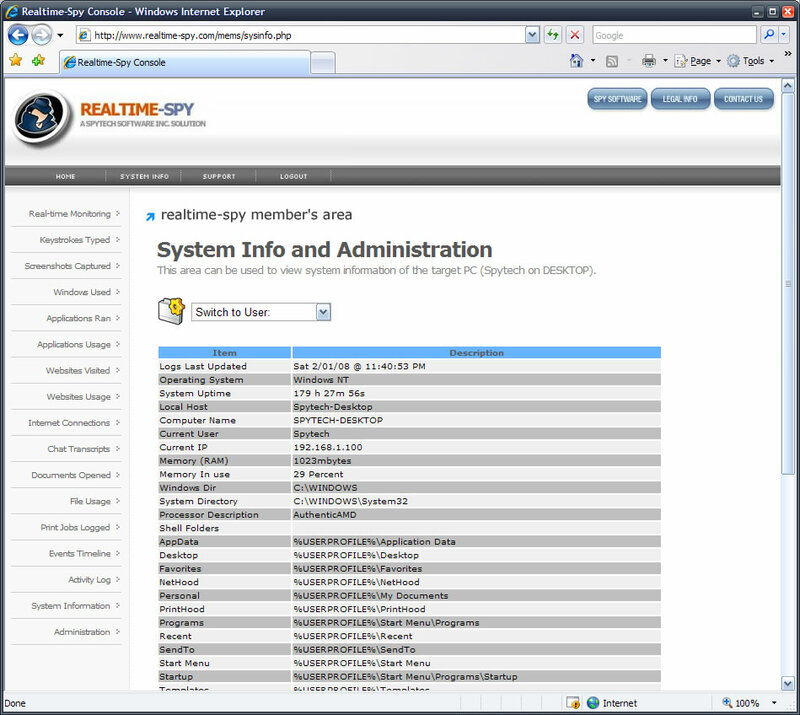 Realtime Spy will show you programs opened and closed, windows viewed, documents opened or printed, files deleted or created, and websites visited in real-time, as the teenager performs the actions. Realtime Spy can also show you every keystroke teenagers type in real-time. Log all keystrokes typed by the teenager. Logs are automatically pre-formatted from backspaces for easy web viewing via your secure Realtime Spy webspace. Have all POP3/SMTP emails that a teenager sends and receives forwarded to your own private email account for later viewing. Now you can see all email activity that is going on when you are not around. Log all events teenagers performed and view them in an organized chronically ordered listing. 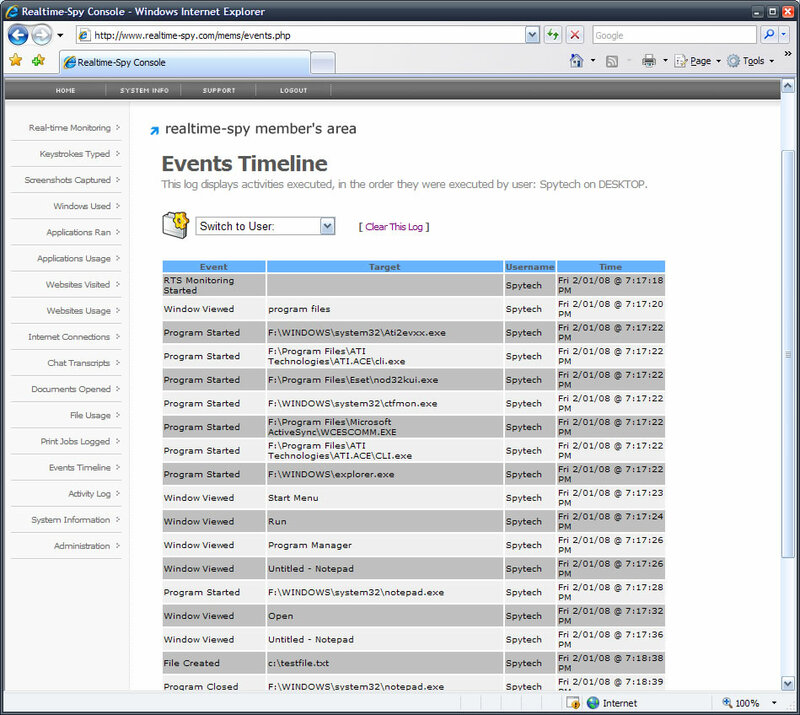 The Events Timeline lets you view what the events the teenager performed, in the order they did them. Events logged include Program Starts/Stops, Website Visits, Document Viewings and Printings, and more. Log screenshots of the active window the remote user is working in and interacting with. Log all website visits performed by the popular browsers used today. All website visits are logged by website address, username, and time of the site visit. Realtime Spy also logs how long teenagers visit each website so you can easily see what websites are visited the longest. 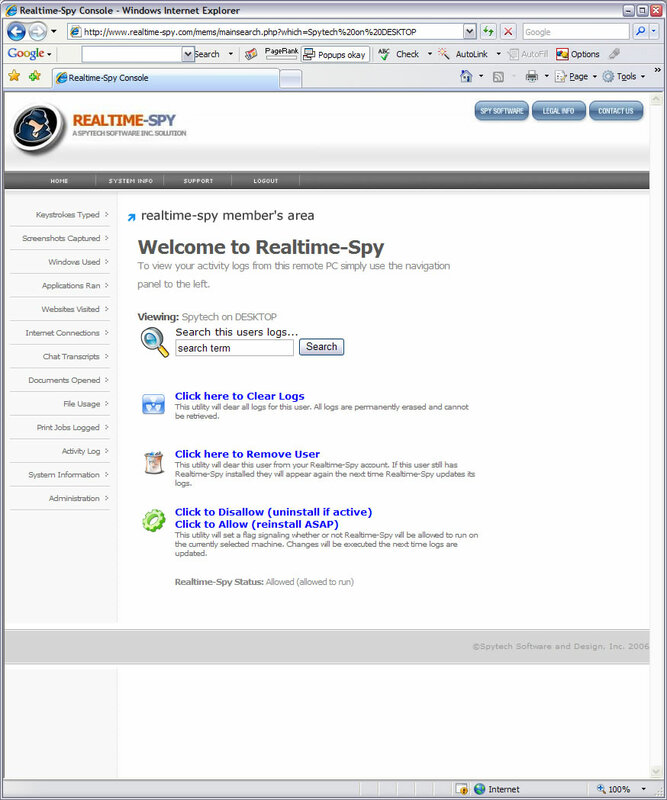 Realtime Spy supports the latest versions of the following browsers: Internet Explorer, Netscape, Opera, Mozilla, Firefox, Flock, Google Chrome, and America Online. Log all internet connections made and attempted by the teenager. Logs include the remote host/port and local host/port. Log all windows opened and used by the teenager. Log how long teenagers are active, and inactive during each computer session. Logs show when each session started, and when it ended. Monitor and log both sides of all chat conversations made on chat clients. Supported clients include the latest versions of: AOL (including 9.0 and Optimized), AOL Instant Messenger, AIM Triton, Yahoo Messenger, MSN Messenger (including 6.x and 7.x), Excite Messenger, GoogleTalk, Skype, XFire, and ICQ. Monitor and log all applications ran by teenagers - Realtime Spy logs when the application was started, stopped, and how long it was actually used. Log all print jobs executed by the remote teenager. Log all files and folders created and deleted by the remote user - including those on portable/removable drives. Log all files and documents viewed by the remote user. Record and monitor system information on the remote machine: uptime, memory, ram, and more. You can also remotely shutdown, reboot, restart, logoff, or freeze the remote PC as well! 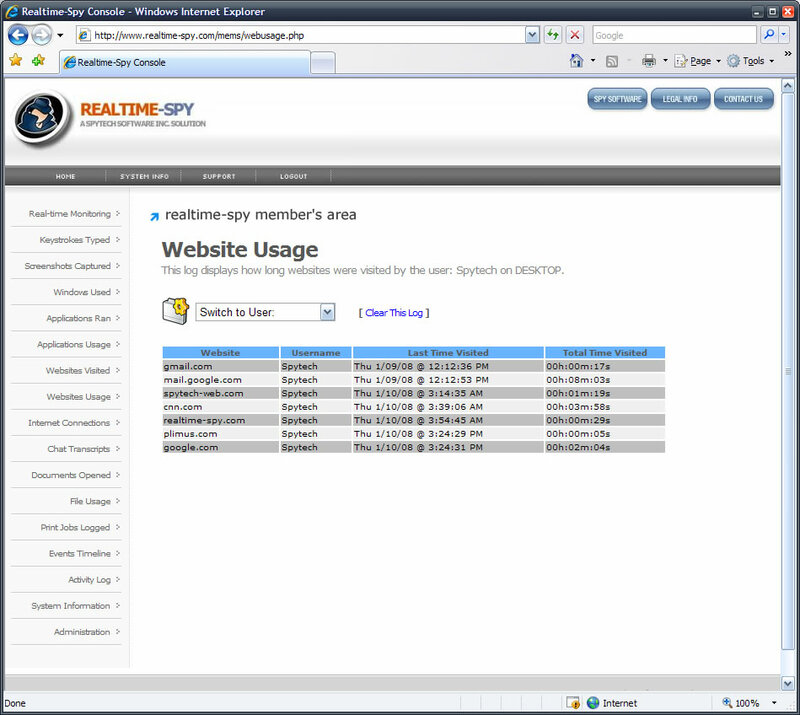 Realtime Spy is built with security in mind since it is remote based. Realtime Spy can operate in complete stealth, can be deployed remotely, and is password protected from outside teenagers. Only you can access the remote PC. Once installed, Realtime Spy is undetectable to all teenagers. 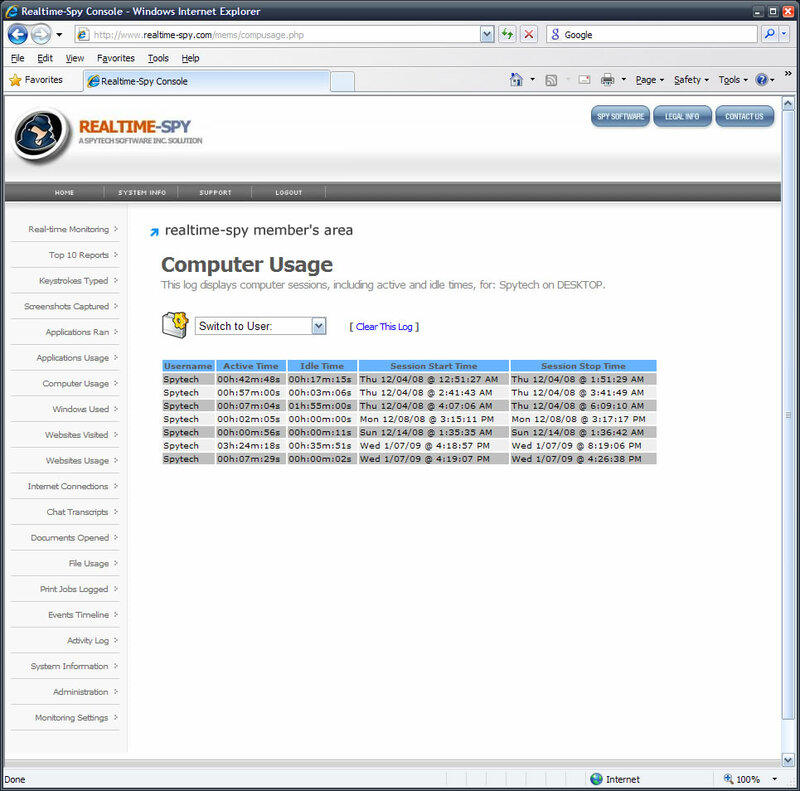 Using minimal PC processing cycles, Realtime Spy is not visible in any way to the teenager, and records and stores all logs without any teenager notification. Realtime Spy cloaks itself to hide from the remote teenage user, so the original file you deploy can be deleted - yet the PC still stays monitored! Realtime Spy can be remotely deployed easily with just a few clicks and minimal user configuration. Email Deployment: simply send your configured Realtime Spy module to the remote PC. The teenager only has to run the attached file - they do not have to respond or send you any response to start monitoring - they only have to 'OK' the notice that states monitoring software is being installed on your computer. Extra-Secure Email Deployment when combined with our Stealth Email Service! LAN/Network Deployment: Easily deploy Realtime Spy over a network via network shares or logon scripts. teenagers will only have to 'OK' the installation with a single click. All your logs are password protected via secure web encryption. Only YOU can access your secure log webspace to view logs! 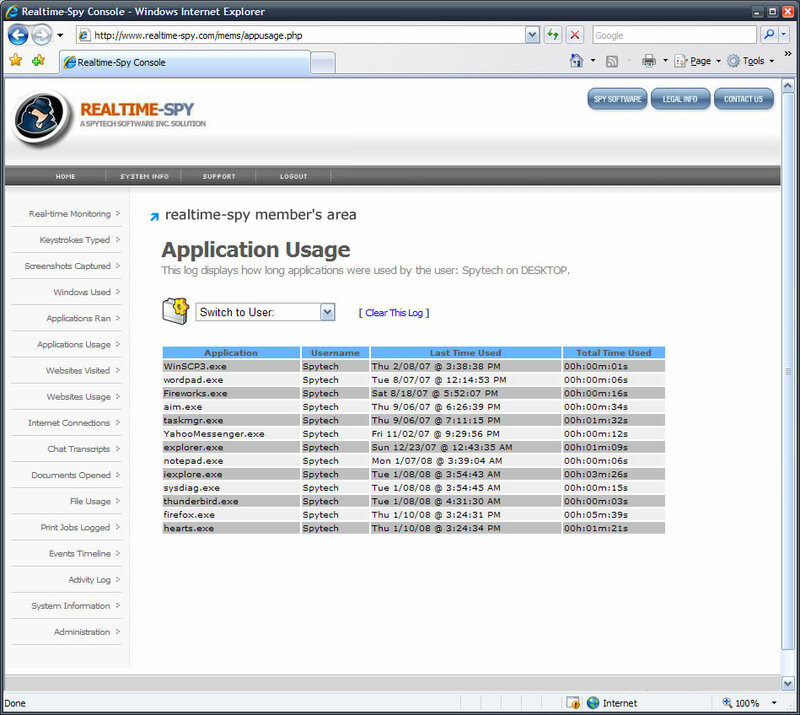 Realtime Spy does not put your monitored data at risk - as other remote monitoring tools do - by allowing direct connections to the remote PC for data retrieval: all data is securely stored on our servers for viewing ONLY BY YOU. Realtime Spy will not stop monitoring if the teenager reboots - it will ALWAYS record their activities. Realtime Spy allows you to remotely shutdown, restart, logoff, freeze, and lockdown the remote PC via your administration area! Realtime Spy is Easy to Use! Realtime Spy is very easy to use. 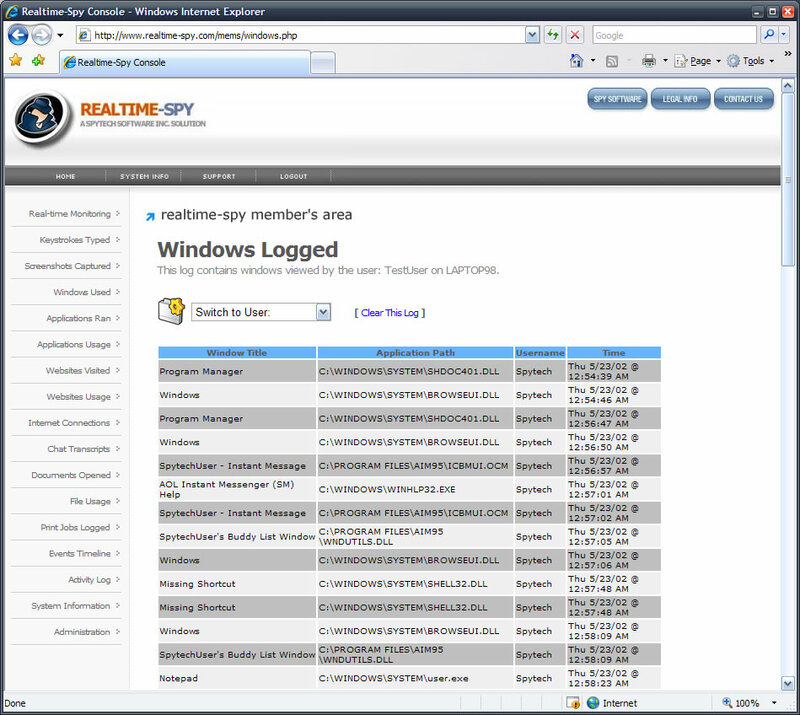 All activity logs and remote computers can be viewed using your web-browser from any Internet-connected location. Setup is a breeze with our installation guide. 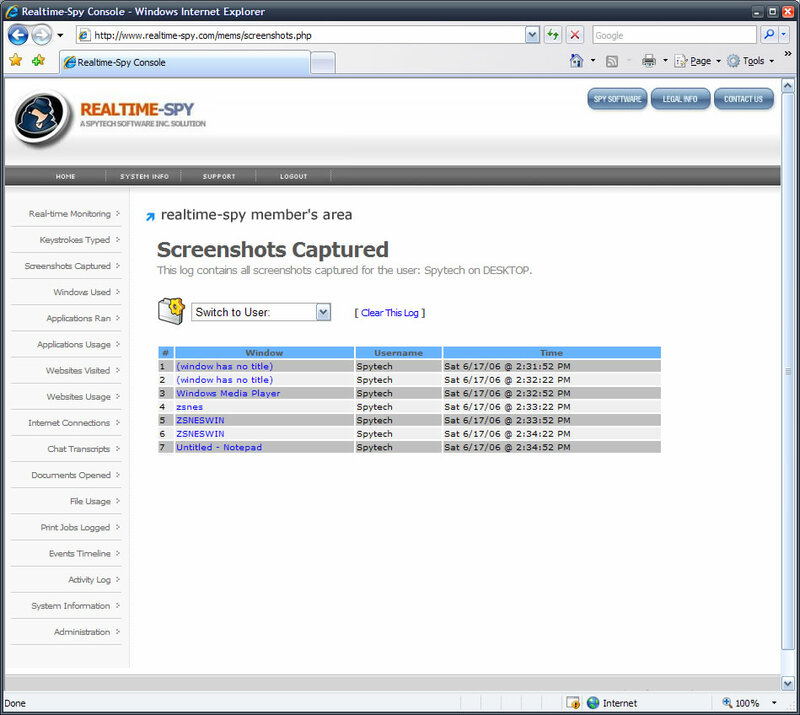 Realtime Spy's web interface is extremely easy to use - just point and click the logs you want to view! 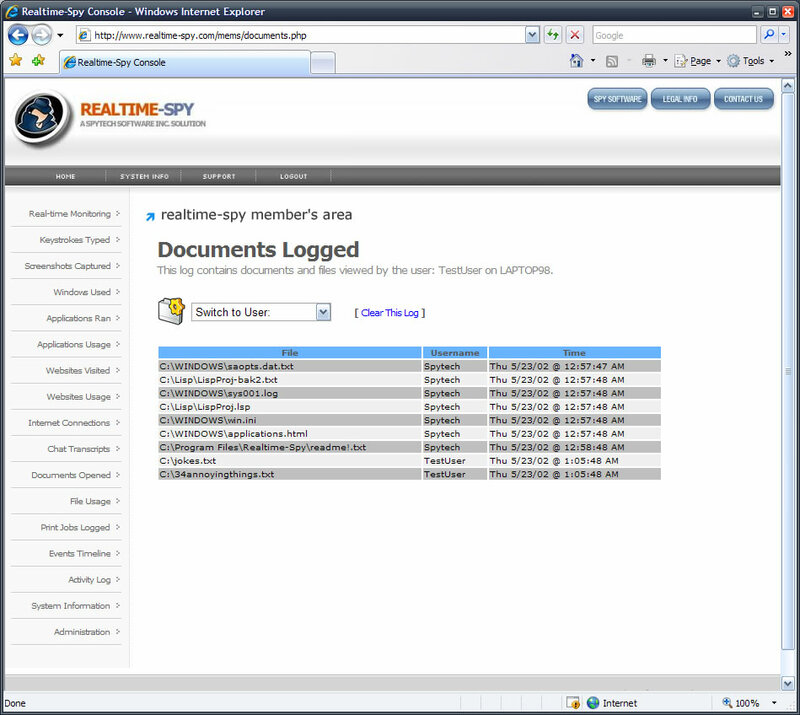 Realtime Spy's web interface allows you to clear individual logs, all logs, or entire teenagers from your webspace in seconds! 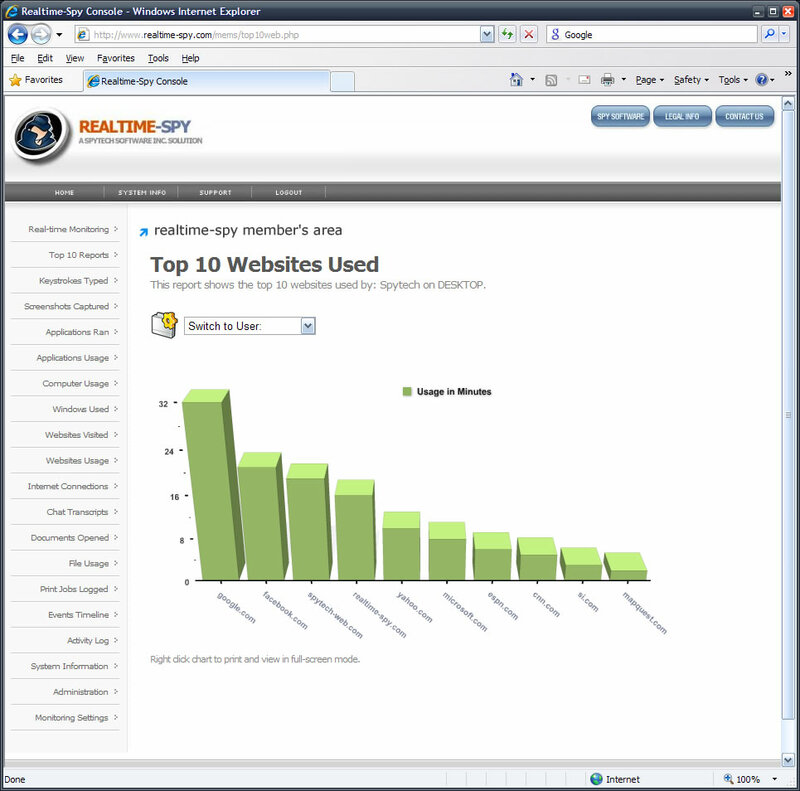 Realtime Spy's web interface can display useful Top 10 activity charts for computer usage (most idle and active teenagers), file usage, website usage, and application usage. 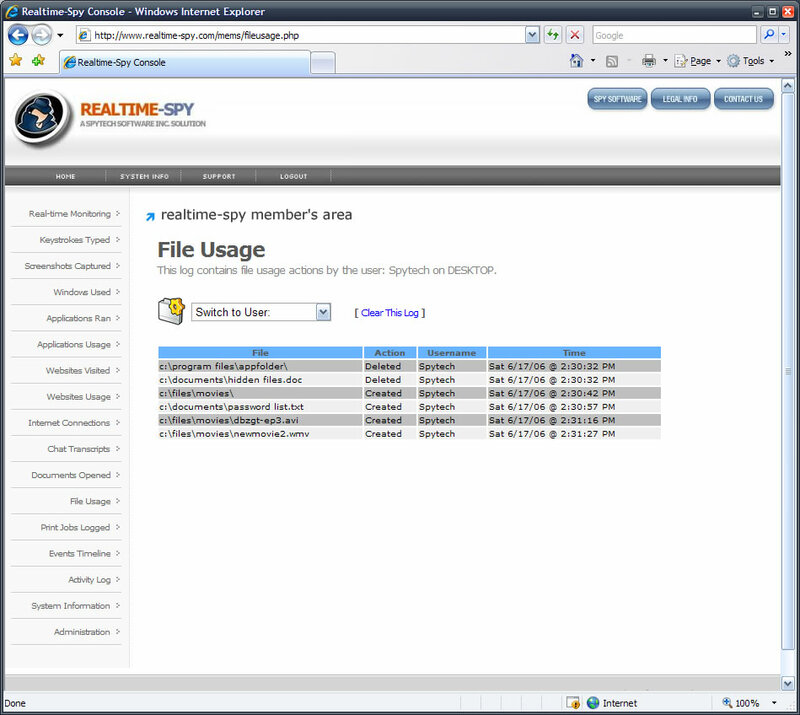 Realtime Spy comes with an easy to use archive utility that allows you to download logs from your webspace for local log viewing and management. Realtime Spy is extremely easy to setup and deploy - just enter in your username/password and you are ready to go! 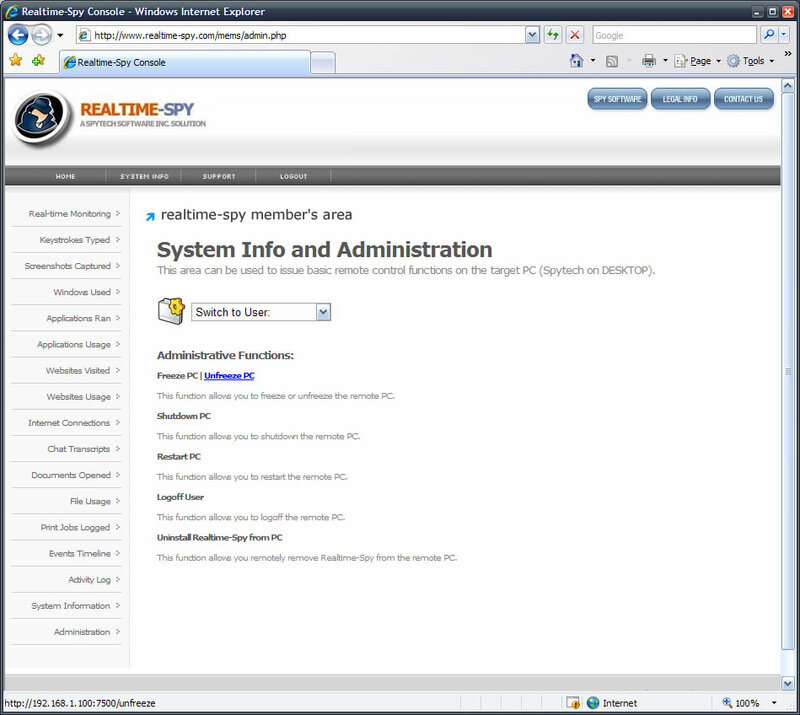 Realtime Spy is accessible from any web-browser, from any location. Just access your personal web-space! Do not want Realtime Spy running anymore? You can remotely uninstall it via your Realtime Spy administration area. Quickly search the activity logs for keywords!